Original Buddhism evolved schools approximately 100 years after the parinirvana of the Buddha, and far transmitted southwards and northwards at the period of Ashoka (3th century BC), Theravada and Sarvastivada were most influential then, throughout south to Sri Lanka（the Tripitaka and notes and commentaries of Theravada still remains intact today), north to China (the extant texts of Sarvastivada are most abundant). Yijing (Tang dynasty, 635-713) has said in his A Record of the Buddhist Religion as practised in India and the Malaya Archipelago: All that is spreading in South India and Sinhala (Sri Lanka) is Theravada, and in North India and South Sea States(Southeast Asia) is Sarvastivada. The prevailing of these two sects at that time can be seen. The chinese Samyuktagama is an early version of Sarvastivada, which was brought from Sri Lanka by Faxian（337-422）, and translated by Indian eminent monk Gunabhadra（394-468）. It's the only one from Sanskrit among the northern four Agamas, deemed to be the words of the Buddha which is most close to the Original Buddhism Texts. Correspondingly, the southern Pali version Samyutta Nikaya completely retains the original state of the Theravada’s Texts 2300 years ago, which is the earliest version among the extant Buddhism texts. Unfortunately, such a rare edition has been disgraceful because of its “Hinayana” status since coming to china. After thousand of years, its sequence was disarranged, scrolls were lost and became incomplete, coupled with wrong transcribing and wrong complement, which made it difficult to read. Until modern times, Lucheng, Yinshun and other progenitors did a lot of pioneering research work on it. Just on the base of their work, this set of books the Collation and Annotation of Samyuktāgama made arduous efforts to extend the exploration in order to reach the truth. 1. Compile category and retrieve the lost, correct errors and complement the text. According to the styles recorded in Xuanzang（602-664） and Yijing’s translations recompiled the category and restored the order of scrolls. Using Tripitaka Koreana as master copy, Fangshan Stone carving Tripitaka, Zhaocheng Jin Tripitaka and so on about ten block-printed editions as proofreading copies, together with other scriptures and treatises both of chinese and Pali, collated the whole text, translated two lost scrolls from Pali Canon further to make the text complete. 2.Collate chinese version with Pali Canon carefully, annotate ancient texts with ancient texts. Collected Southern Pali Tripitaka , Northern Matika, the offprints and the various editions of Agama, Sarvastivada Abhidharma, Sarvastivada Vinayapitaka, etc, for cross-reference and variorum gloss, without ignoring or omitting, integrated them all into the dictionary. 3.Compare the southern with the northern, prove the same source of them. Studied the early texts of Pali Canon and Chinese versions fully and deeply, complemented and corrected the corresponding sutras, recorded all the traces and evidences, which demonstrate the northern Agama and the southern Nikaya are from the same source, the words and sentences, the grammar and meaning of contemporary texts prove each other strongly，while those later texts are far less. Through collation, reorganization and addendum, the whole text consists of 4 parts, 7 chapters, 56 samyuktas and 8491 sutras, divides into 3 categories: sutra, geya and vyakarana. The compiling of this set of books is a huge and complex project, the authors did their utmost, spent more than fourteen years to complete it, filling many gaps in research fields of Samyuktagama and even Original Buddhism . This set of books are collated and punctuated correctly, translated accurately, and annotated detailedly, not only restores Samyuktāgama to original, clears out all the obstacles in texts, but also outlines and sharpens the frame of Original Buddhism idea, makes this rare ancient edtion which has been ignored for thousand of years, renovated and dignified again. Dedicated to the memory of the 2500th Anniversary of Buddha’s Nirvana and the First Buddhist council at Rajgir (486 B.C-2014 A.D) - the publication of the Collation and Annotation of Samyuktāgama in July 2014. 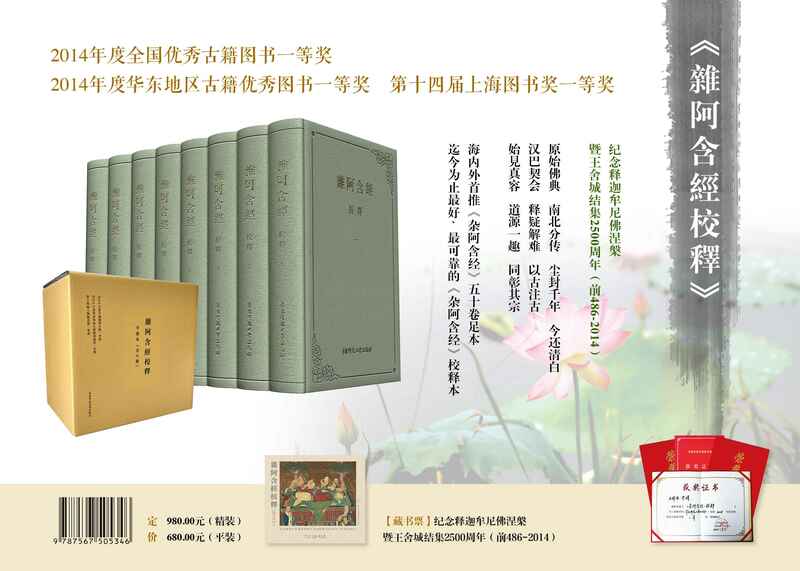 This work is a funded project by Shanghai Publishing Funds in 2013, the first prize winners both of the National Excellent Ancient Book Award and the Excellent Ancient Book Award in East China in 2014, and the first prize winner of the 14th Shanghai Book Award. Wang Jianwei (1958~) and Jin Hui (1971~), graduated from East China Normal University, learned the Pāli Canon from Ven. Prof. Dhammadinna at University of Kelaniya Sri Lanka, made a deeply comparative study of the thought and history between Southern Buddhism and Northern Buddhism. Since the beginning of 2000, besides concentrating on the research of Samyuktāgama and the relevant original Sutra and Abhidharma in Chinese and Pāli, they also established Āgamārāma, completed the Collation and Annotation of Samyuktāgama (8 vols., published in 2014), and have a number of their other works and translations published in China and abroad, including Chronicle of Zen Master Laiguo, the True Meaning of Life, etc..
详情介绍　 百度百科 豆瓣读书 Wikipedia Press Ltd.